I purchased the G0490XW. I ordered the one that I wanted and waited for to come in: it was on back order. Came in about mid November 2016. Yes it has the spiral head and mine worked first time just fine. Still tuning in some stuff. I probably still have a little to learn about it yet. However, my boards come out very flat and the edges are very square. Took a while to get it square. I mean really square. So gluing up produces nice flat work. It does exactly what a jointer is supposed to do. The finish is so good it just takes a little sanding to have a finished product. The old 3 or 4 straight knife system always left serious mill marks and sometimes significant tear out. 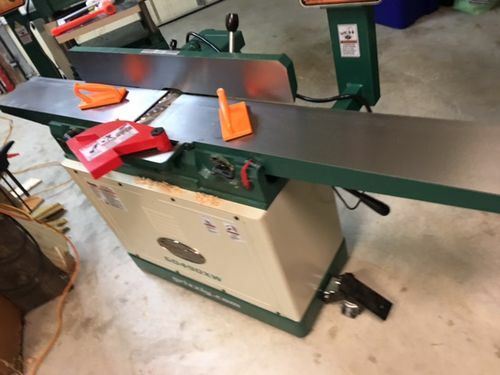 I also bought the G0490XW Planer at the same time. Again, every thing worked the first time. I took time to read through a few people’s reviews, watched a few videos and had everything I needed to assemble the Planner and Jointer. I did have to buy a chain hoist for the planer to get it off of the truck and to assemble it. Definitely easier with 2 people and more fun too. It took a lot of work to do everything, check and top off the gear oil, lubricate everything that were supposed to be lubricated. But taking the time to assemble both of them carefully has paid off. I took about a Saturday afternoon to assemble the planer, and a few hours to assemble the jointer. I love that they roll so easily. I just roll mine out on the cement drive way and do the messy work outside. It produces a lot of chips. I live in Tennessee and the weather here is good enough to work outside most of the time. I too have purchased one of these jointers. It took four men to get it form my garage (it was placed in my wife’s spot) down into the walk-out basement where the shop is. I am impressed by the quality and after checking to make sure everything was coplanar and square, it was ready to go out of the crate. Although I seemed to have missed the part about “topping off” the gear oil? The Gear Oil was the planer that I got at the same time… But I think you knew that. We put together the base in the drive way and slid the jointer out of the side of the crate sliding it on to the plastic liner of the truck bed. Then gently onto the the Jointer base. Then we assembled the bolts holding it together. Over all it went together very well and quite quickly. We were able then to roll it where ever it needed to go. Took a few seconds to figure out the fence configuration. Getting the fence just perfectly square was a trial in patience. I have had a few other eight inch jointers and once the fence is set perfect there is no real good reason to change it. I am so not worried about wearing out the one area on the jointer. That is why I wanted the index-able incerts. They will last an incredibly long time and can be turned as needed. And then are not very expensive so why move the fence. I had to know if the parallelism was withing speck so I bought a mag base and dial indicator. Spec. is .003” and from one side of the in-feed table to across the out-feed was with in @ .002. I checked it from a few areas. I did not ck the co-planer lengthwise because the 5 ft. boards I was jointing were very straight for that I was gluing up together. I don’t have a really good straight edge. I have a very nice level, but I doubt it is straight within .003 itself. I hope your jointer works well for you Mike. I haven’t fired it up yet. I got it into the shop and set up before the electrician has had a chance to run the 220. After Thursday I will know. Wow I understand. I had to run 220 to my garage and I was not excited to do this. But I have done a lot of various work, and it went well. The Planer and Jointer were super and the electric was just fine. We put in a 50 amp sub panel and ran 3 220 plugs. One for the Planer, one for the Jointer, and one for the table saw. Table saw is still in Mich. Have not gotten back up there to get all my stuff and it has been nine years now. So how is it working Mike? OK today I was getting ready to glue up a table top and I noticed a slight amount of light between the boards. 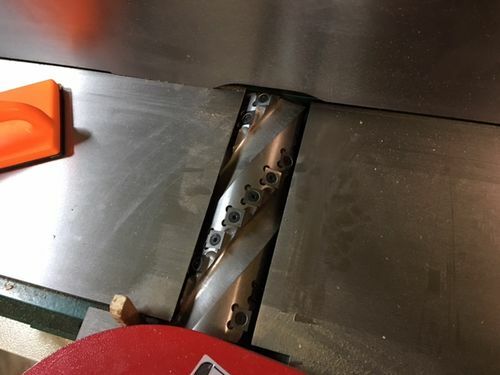 I was hesitant to make adjustments on the Jointer out feed table because – well you know why. It is already pretty good, but could be a bit better. So I adjusted the out feed table about .010 on the out feed table raising to outer end (Both sides). That was a little too much and I had to put it back to .0075 total raising it. Now it seems about perfect so far. I bought a mag Base and dial indicator just for this.